Artist’s impression of Bajadasaurus pronuspinax, a newly discovered sauropod dinosaur from South America. Paleontologists in Argentina have uncovered a dinosaur unlike anything ever seen before. Alive some 140 million years ago, these majestic herbivores featured long, forward-pointing spikes running along their necks and backs. These spikes may have served a defensive role, but their exact purpose now presents a fascinating new mystery. New research published this week in Scientific Reports describes a new species of dinosaur its discoverers are calling Bajadasaurus pronuspinax (pronounced “BA-HAD-AH-SAURUS” “PRONE-OO-SPIN-ACKS”). The first half of its binomial references to the geological formation where its fossils were found, the Bajada Colorada Formation in Northern Patagonia, Argentina. The latter part of its name means “bent over forward spine,” owing to its most distinctive feature. The fossilized remnants of this extraordinary creature, including a nearly complete skull with some teeth, were uncovered in 2013 by paleontologists from CONICET, Universidad Maimónides, and several other institutions. Bajadasaurus was a sauropod, a wildly successful group of long-necked, four-legged dinosaurs. A Lower Cretaceous dinosaur, it lived 140 million years ago in what is now Argentina, and it belonged to a subgroup of sauropods called dicraeosaurids—medium-sized sauropods with distinctive vertebrae and long spines along their necks and backs. Lead author Pablo Gallina posing with the new reconstructions. Analysis of the Bajadasaurus skull and teeth suggests they grazed on low-lying plants. Their eye sockets were located near the roof of the skull, allowing them to keep watch for predators while they munched on foliage. In the beautiful art produced by Jorge A. González, a small pterosaur can be seen perching on a Bajadasaurus spike—a nice touch, given how prolific these winged reptiles were in South America at the time. 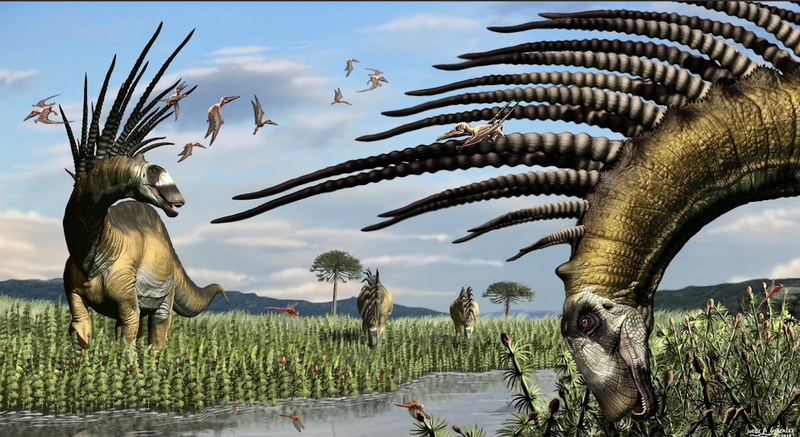 Reconstructions of the spikey beast were recently unveiled at the Cultural Science Center in Buenos Aires (pictured above). Prior to this latest discovery, paleontologists had uncovered another South American dicraeosauridae with spikes, Amargasaurus cazaui. This sleek-looking sauropod lived around 15 million years after Bajadasaurus, but its spikes were much shorter and they leaned backward instead of forward. Bajadasaurus is notable both for the size of its spikes and their forward-leaning orientation. The longest of the rod-like neural spines measured nearly 5 feet in length, close to 150 centimeters. Indeed, the exact function of the spikes isn’t clear. Possibilities include heat regulation (an issue for large-bodied sauropods), sexual display (horns to make dinos horny), a fat reservoir (the fat stores would be located between the spikes, and similar to a camel’s humps), and defense against predators. The authors of the new study, led by Pablo A. Gallina from Universidad Maimónides, favor the idea that the spines served as “passive defense structures.” Any would-be predator, the authors surmised, would risk impaling themselves on these formidable structures during an attack. For that hypothesis to work, however, the long spines would need to be strong enough to avoid shattering or fracturing. Fossil elements of Bajadasaurus pronuspinax. Eric Gorscak, a postdoctoral research scientist at The Field Museum in Chicago who wasn’t affiliated with the new study, said “Bajadasaurus is certainly a bizarre discovery,” but like Brusatte, he’s skeptical about the authors’ defense hypothesis. Stephen Poropat, a paleontologist from Swinburne University of Technology in Australia, thought the new discovery was significant owing to how much of the skull was recovered, but he was “intrigued” by the significance the authors afforded to the forward-pointing spines, which appeared on only one of the three neck vertebrae recovered. He also said it’s difficult to know the kind of soft tissue that once covered these spines. He agreed that keratin is a possibility, as the authors suggest, but it’s also possible the spines were surrounded by soft tissue, or used to support a frill, he said. A reasonable next step for the authors would be to put their theories to the test, and conduct some experimental paleontology. This could be done using computer simulations or with materials that approximate the strength of the Bajadasaurus spikes. Similar experiments have been done before, for example, with researchers using models to estimate the maximum running speed of Tyrannosaurus rex before it would snap its legs with its tremendous bulk. The exact purpose of the spikes aside, there’s no question Bajadasaurus is one of the more spectacular dinosaurs we’ve seen in quite some time. It’s incredible to think of all the things we’re still learning—and still hope to learn—about the remarkable creatures that lived long before humans. This post was updated to include comments from Stephen Poropat.